After a nine month search, county officials have selected Vivian A. Kiggins as director of the Bergen County Animal Shelter located in Teterboro. Ms. Kiggins has a degree in zoology where she majored in mammalogy. She is a Ringwood resident and a coordinator of a non-profit animal assistance program. After working for more than 22 years for animal welfare agencies, she will be paid $75,000 per year. She worked as the first coordinator of an animal welfare assistance program with a $900,000 budget for Geraldine R. Dodge Foundation. This New Jersey based program began in 1985 and made grants to animal shelters, pounds, rescue groups, rehab and low cost spay/neutering. She also ran an animal shelter in Yonkers, worked as an animal vector control specialist with the Westchester County Health Department and as a mammal keeper at the Bronx Zoo. At St. Huberts Shelter Partner Program she was coordinator for 10 years where she held workshops for staff training and continuing education. She also helps coordinate an annual giant pet food drive that generated 50 to 70 tons of food for distribution to 70-75 groups around the state. She stated that the staff and volunteers were wonderful, cooperative and anxious to provide all the services we can. Ms. Kiggins commented that, "shelters should be a community resource providing assistance, education and loving pets to residents." "Shelters have to be clean, inviting, staff friendly and compassionate, and that animals have to be socialized, clean, healthy and safe for adoption." Her vision for the Teterboro Shelters' future include: increased adoptions, reduced euthanasia and to promote the general health and welfare of the animals. Since 2003, the shelter has had two directors. Bob Nesoff, a Democratic operative and animal cruelty officer, was appointed in February 2003 and was transferred to another county department after complaints by volunteers and employees and a failed state health inspection. 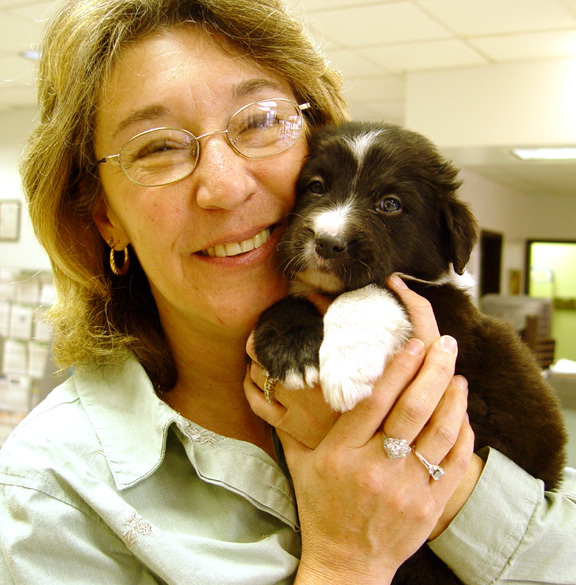 He was replaced by veterinarian Marianne Gallagher who was the first veterinarian ever to run this shelter. Dr. Gallagher resigned after three months in February 2004 after a fire in her Pennsylvania home that killed 48 animals that she kept there. A search committee was formed in February 2004 to find a new director. In September 2003, the shelter failed a surprise inspection by the State Health Dept.which found animals living in filthy cages, poor ventilation and without enough water. The inspection spurred changes with the county hiring more staff and putting more money into the operations  which had always relied heavily on volunteer labor and donations. A concerted cleanup effort was made and the shelter passed a re-inspection in October 2003. The shelter holds stray dogs, cats, rabbits, hamsters, guinea pigs and ferrets from across Bergen County. The shelter has 38 full time employees with a $1.1 million dollar budget  was expected to increase by 1/3 in 2004. Plans include renovating the entire heating, cooling and ventilation system for the animals. Friends of the Bergen County Animal Shelter has about 100 volunteers and an estimated 5,000 donors who help care for the animals.